Mother Nature has decided to grace us some sunshine and heat in the middle of winter. For the past week it has been sunny and relatively warm in the Bay Area. So we decided to pack for a nice picnic and enjoy this beautiful weather in the nature. 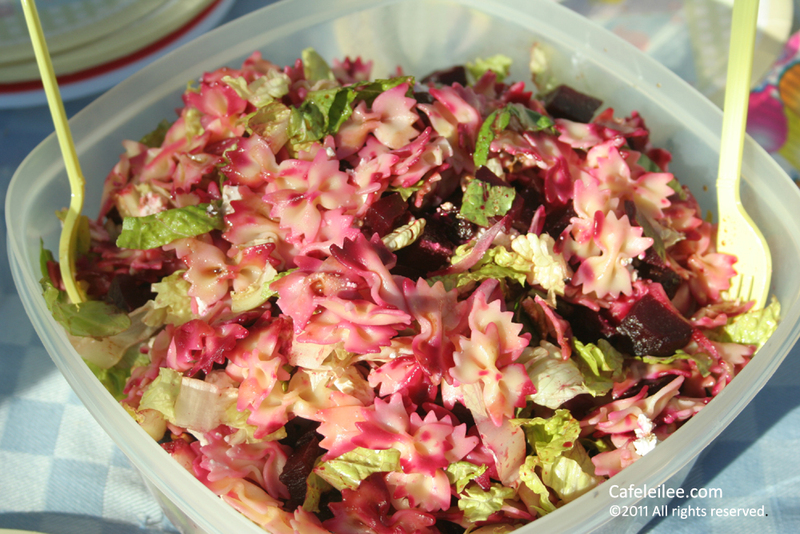 Here is the recipe for the salad we enjoyed in our picnic. Needless to say the striking pink color of this salad made it appealing to the pickiest seven year old I know! Cover a baking sheet with aluminium foil, rub the beets with some olive oil and let them roast in the oven for about 40 to 45 minutes until they are cooked. In the meantime, cook the pasta according to the package direction and let it cool. Chop the lettuce in small pieces and in a large bowl toss them with the cooled pasta. Remove the skin from the cooked beets and chop them in small pieces (about the same size as the pasta), add them to the pasta and lettuce. Add the chopped red onion, walnut and feta. In a small bowl combine, honey with olive oil, balsamic vinegar and salt and pepper and whisk until combined. Add them to the pasta salad, let the salad sit in the fridge for about 1 to 2 hours until the flavors combine. فر را روی درجه ۴۵۰ فارنهایت یا ۲۳۰ سانتیگراد روشن کنید تا گرم شود. لبوهای شسته را کمی روغن زیتون بزنید و در سینی فر بچینید و بگذارد توی فر به مدت ۴۰ تا ۴۵ دقیقه پخته شود. در این مدت ماکارونی را بر اساس دستور روی بسته بپزید و آبکش کنید و بگذارد تا کمی خنک شود. کاهو شسته شده را ریز خرد کنید. پوست لبو های پخته شده را بگیرید و آنها را به اندازه ماکارونی ها خرد کنید. توی یک کاسه بزرگ، لبو خرد شده را با ماکارونی پخته شده و کاهو مخلوط کنید. پیاز، گردو و پنیر را هم اضافه کنید. توی یک کاسه کوچک، عسل را با سرکه بالسامیک و روغن زیتون و نمک و فلفل مخلوط کنید و روی سالاد بریزید. مواد سالاد را خوب مخلوط کنید و بگذارد درون یخچال به مدت ۱ تا ۲ ساعت بماند تا مواد خوب با هم مخلوط شوند. سالاد را میتوانید سرد یا در دمای معمولی سرو کنید. This looks lovely! I love beets. They've grown on me a lot in the last two years and I'm always looking for fun ways to enjoy them. Thank you for sharing?